The last post I wrote was written in a 2AM haste. Here is a more concise account of the life of my second great grandparents, Anderson and Malinda. To see the only photos I have of them, please refer to this post. Anderson was born in Lexington, Holmes, Mississippi to a slave named Virginia and a white slavemaster named Samuel Moore in 1862. In the 1870 census, Anderson Moore, age 8, is living in a house with Richard Moore, age 9. I highly suspect that this was my Anderson living with a possible brother. Why they were alone with no adults is a mystery, but 40 pages away on the census are Samuel Moore with his family, and Virginia with her other children (both older and younger than Anderson and Richard) are three houses away. 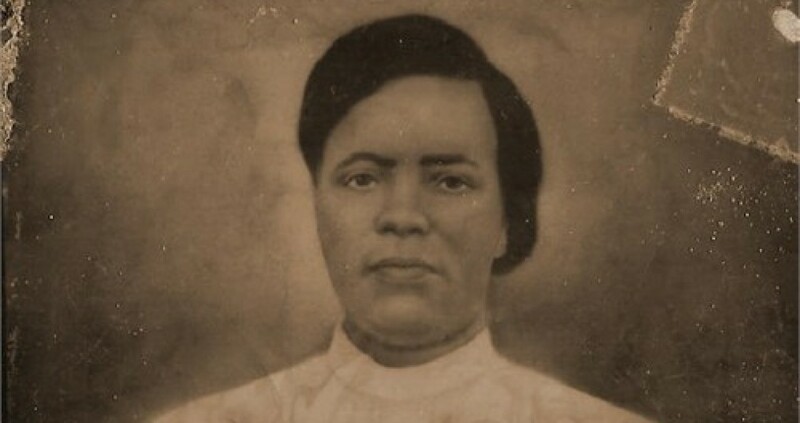 Malinda Baker was born a slave in 1864 to Jacob and Amanda Baker. In the 1870 census, her family lived a few houses away from Anderson’s mother. Anderson and Malinda had planned to wed later but Malinda’s pregnancy at 16 with Mamie (my great grandmother) forced 20-year-old Anderson to marry her earlier. His will would suggest, although Anderson had some fidelity issues, that Malinda was the love of his life. The next we see of Anderson and Malinda is in 1910. Per my aunts and newly found cousin, Anderson’s father left him some land that Anderson allowed his family (children, brothers, and sisters) to live on rent free as long as they kept it up. Sadly, I did not see Richard. In every census from 1910 to 1930, Anderson and Malinda are living with a revolving door of children. I am told that they were always willing to take in a niece or nephew when a family member couldn’t take care of them from time to time. There were also what my aunts called “outside” kids. Anderson had a few kids outside his marriage that Malinda demanded he take care. When Malinda got wind of them, Anderson was forced to sleep in the barn for three months. I am not sure if this was before or after the birth of Oscar, Let me back up a bit. Anderson and Malinda’s kids were (in order of birth) Mamie (my great grandmother), Jacob, Sue Hallie, Telitha, Olivia, Ora, Occie and Obbie (twin girls), Benonia, and Charley. And although, the “outside” kids and nieces and nephews were always welcomed to stay with Anderson and Malinda, they usually went home to their mothers. These three who were raised by Anderson and Malinda together were George (Anderson’s sister Dollie’s son), Harvey Alexander, and Oscar (the youngest). Harvey and Oscar were both from affairs that Anderson had. Another family story is that Oscar’s mother was dying after giving birth to him. She sent for Malinda and asked her to raise him. So, since birth, Malinda regarded Oscar as her youngest baby and Oscar, although he knew his biological mother was not Malinda, regarded Malinda as his mother. Now, my aunts swear up and down that one of Anderson and Malinda’s daughter’s husbands (not my great grandpa) somehow framed George and that Anderson believed the son-in-law did it, but he did not want his grandkids to grow up without a father and for his daughter to be on her own. My aunts said this was known throughout the family. He did try to help George. I am not sure what became of George, but he is mentioned again in Anderson’s will that is still to come. Anderson died in 1939. I found his will on Ancestry. He wrote it like a man who knew he was dying. He confessed his love for Malinda, which I thought was sweet, and gave her everything upon his death. Anderson stated in his will that upon Malinda’s death, which was in 1943, the children would each be given equal shares of his land, but George would be given a $1. Now, I cannot decipher if he was trolling George for killing Jacob or if George was jailed and much more would have done him no good. (I am not sure how much he really believed George was innocent and the son-in-law was guilty.) One dollar in 1939 was worth $17.25. Oscar had made some money in Chicago and would eventually buy everyone’s land. The farm is still with Oscar’s direct descendants this day. I wavered on adding my aunt’s sentiments, but family is colorful. And her comments, though I do not agree, are beautifully bold and full of personality that a descendent one day will look back on and have a sense of her personality, hopefully, a chuckle. I heartily laughed. I, for one, would love to see that farm and eat watermelon in the hot Mississippi sun on it. 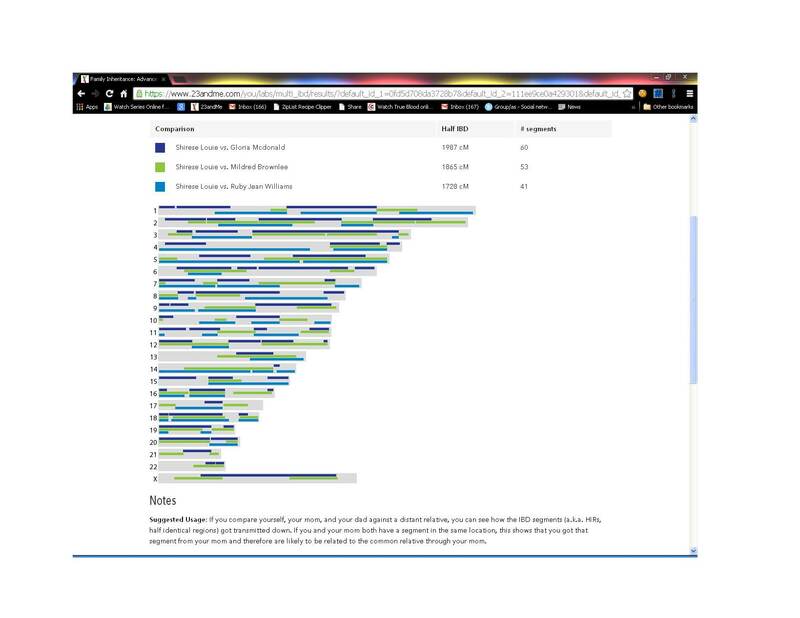 I am using an illustration between me and my (half) sisters to show what one actually sees when they agree to share (or more accurately, compare) genomes on 23andMe. All you are doing is visually seeing exact what chromosomes and segments shared between you and the other person. It is quite harmless. DNA genealogy should not be a parlor trick. This is real and serious stuff. It has been a while since my last post. Well I have graduated, and a new chapter begins. I don’t have any new discoveries—only thoughts. I notice that many newer people who have gotten into DNA genealogy are only interested in the most uncertain and ever-changing aspect of it, the ethnicity mix. (Heck, I even initially was swept up in it and posted my and my sibling’s results in a post.) These are the same people who refuse to believe the more concrete and never-changing part of the science, the matches. After a certain percentage of centimorgans of DNA shared, the odds of it being a false positive is null. There are not many African Americans into genealogy, and this is a shame. We could really help each other piece things together. (Genealogists helping fellow genealogists is also a problem that I will bring back up later.) Many African Americans who cross over to DNA genealogy and not part of the people in the above paragraph usually have a one-tracked mind. They see a population that their DNA shows an affinity with and make an assumption that they are part that population. An example is that AncestryDNA shows I have a small percentage of Finno-Russian. I may very well have Finno-Russian. It is also may be Native American. The area that is now made up of the countries of Finland and Russia has been proven by peer reviewed science papers to be an area where some Native American tribes actually came from. (Believe me; I am not chasing that Indian princess relative that so many who take these tests are interested in. I am just looking for the real ancestors that made me.) Basically, I am saying a little knowledge of history should be accompanied when interpreting your results. That was just one example of hitching on to one aspect of one’s results and not investigating further. A huge dose of genetic science by all should be attempted to be understood when interpreting your results. This is mainly the companies’ fault though. They advertise in such a way that leads consumers to believe that once you receive your results all your genealogical and ancestral questions will be answered. This is not the case. You have to work very hard to figure out what the DNA is telling you. I always provide my matches with a link to Kelly Wheaton’s Beginners Guide to Genetic Genealogy. I visit many DNA-genealogy based groups, forums, communities, and message boards, and the snobbery among those who feel like someone else has nothing to offer them (because of lack of family knowledge, small pedigrees, or not coming from the “right” branch) is disheartening. I get that people want to give just as much as they can get, but many people lack family knowledge for legitimate reasons. Simply not being told, being adopted, not having funds to spend on documents, and or not having the luxury to travel to ancestral homes or genealogical databases are all valid reasons. These people are still as much related to those ancestors as the “hoarding” genealogists are. I, myself, do this in hopes that I can freely share what I discover with anyone who will listen. The last thing that I really think genealogy, specifically genetic genealogy can benefit from is a standard that all companies, geneticists, and casual dabblers should adhere by—an internationally recognized board, if you will. And this is where I may turn those who deem themselves “citizen genetic scientists” off. This board needs to be filled with equal parts citizen genetic scientists and actual degree-holding geneticists. How can you discuss genealogy without a genealogist? On the same hand, how can you discuss genetics without a geneticist? On these aforementioned forums, I see a lot of well-respected folks saying opposite things or with agenda and company loyalty. That is not a standard. In other news, I bought a better Web site that I was going to migrate to. It is much more complicated than I had anticipated. More powerful than science, stronger than belief…it is truth! 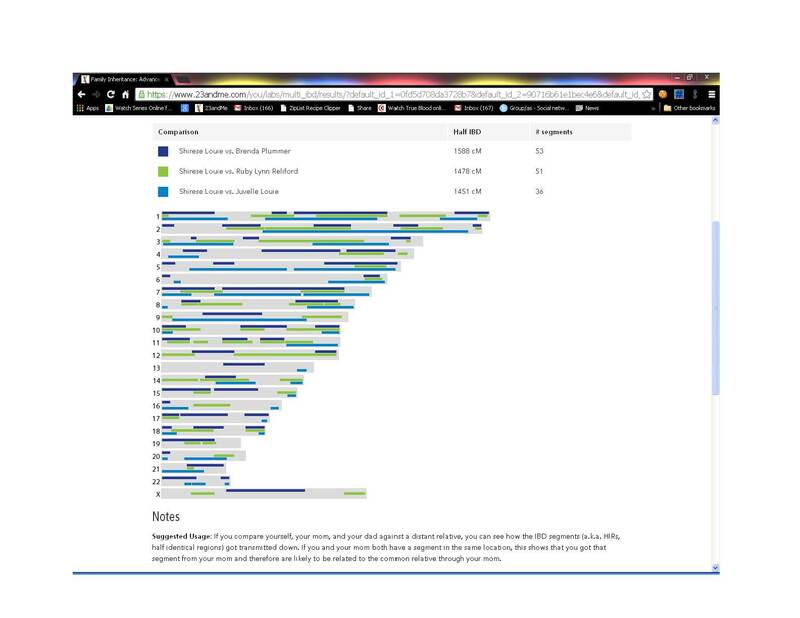 I am glad to see the sea between genealogist who use DNA as a valuable tool and strict paper genealogists is drying up. Paper genealogy got me back to the early 1800s on a few of my lines. For black Americans that is pretty far back. I have always been a lover of stories, fiction, nonfiction, science fiction etc… . In my mid-20s I realized that I had no family stories of my own. Most of my friends had and conveyed them without even knowing they were doing so. My many siblings and I could only say that our mom was from Mississippi and still had family in Mississippi. I grew up not knowing my dad, so that was even more stories unrelayed. Science fiction for a good decade was my fiction reading of choice. I have been fascinated by science, itself, but some smart science fiction that dealt with the biology of humans, human existence, and genetics made science more understandable for me. 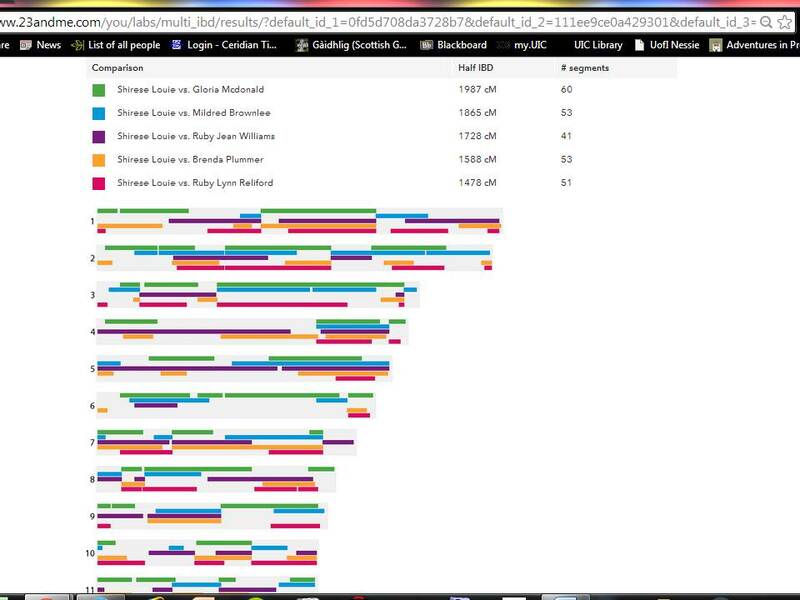 So when I heard of people using DNA in assisting with genealogy (history and science combined), I was excited. Problem was that initial tests were $1000 or more. Me producing that much money for a test would have been a work of fiction, for real. In 2011 DNA testing became more affordable and the prices have since dropped. Therefore, I have gotten my autosomal DNA tested at three companies, five of my sisters’ austosomal tested at one, one brother’s tested at two, had mybrother’s and my mitochondrial DNA tested at two, and my brother’s paternal (in essence, my father’s) paternal Y-DNA tested at two. Yes, you can call me a DNA junkie. Although the paper trail, documentation, and oral history have guided me back further than most people expected I could go, many lines still have gaps. Even those lines that go back to the early 1800s have a chance of getting back to the 1700s or 1600s or beyond. One of my hopes is that DNA will help me bridge the gaps and blaze a trail as far back as I can go. Before testing, the certainties that I could tell you about my family was that we were mainly from Mississippi, we were mainly of African descent, we were mainly of slave descent, and, because of the nature of slavery, we probably had some European blood. After testing I can tell you that many of my DNA matches are mainly from North Carolina, therefore my family was probably there before being enslaved in Mississippi, we have matches to Nigeria and Ghana, my DNA matches seven modern-day African areas (with Cameroon,/Congo, C’ote d’Ivoire/Ghana, Mali, and Nigeria being the top regions), we range from 13% to 25% European and my DNA matches six European areas, one suspected black ancestor successfully made it to Canada before the end of slavery, two suspected European ancestors were brought over as slaves (one English and one Irish), and my father’s father’s father’s father’s line leads to Belgium. Now, some of this knowledge came from collaborating with my DNA matches on what they knew of their own history. Without the DNA, I would not have been led to these clues. Another important thing that I am getting from DNA genealogy is proof that oral history or written documents cannot provide. DNA autocorrects the mistakes or “mis-leads” that have been left from the past. It does not give instant answers, afterall it is a tool that you have to work hard at. It challenges what you have been told or even what you have seen some times. This can be quite scary for some. But it is so exhilarating when you actually confirm that you were on the right track with your paper trail and in your oral history. For me, knowing that an ancestor passed down a piece of themself that made me is something more powerful than science or belief. It is mystical and mesmerizing. It pushes me on with my genealogy because I want to discover who they were, every good, bad, or ugly detail. All of my siblings only share one parent with me. Below is exactly what segments on the chromosome that we match. I was planning on a longer and different post and that is still to come, but I wanted to salute my dad, James Vernon Louie (1947-2001) a veteran who served in the Vietnam War. Thanks to him for sacrificing so much for us. He deserves more than I can give this night but rest assured I am working on a post that is worthy of him.